Altitude: Altitude ranges from 9000 feet (2,750 m) at Kargil to 25,170 feet (7,672 m) at Saser Kangri in the Karakoram. Temperature: In summers, up to 27 degree Celsius, and in winters it is -20 degree Celsius and below in the higher reaches. Ladakh is a dream destination for every traveller. Ladakh is a part of the state of Jammu and Kashmir in India also called the Land of High Passes. Ladakh is one of the highest places on earth with average altitude being above 12,000 feet. This amazing land has never ceased to amaze travellers with its towering peaks, snow-capped Himalayan and Karakoram mountain ranges, rugged valleys, barren lands, the rapidly-flowing Indus and Zanskar rivers and numerous streams carrying the glaciers from the mountains tucked amidst lush green valleys, all making a travellers dream come true. 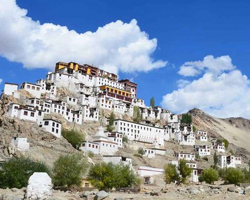 Ladakh is filled with extreme natural beauty; the list also includes ancient monastries, religious sites, and palaces of the royalty, various gompas and wildlife sanctuaries. The rare phenomenon of Magnetic Hill leave everyone astonished. Pangong Lake in Ladakh is undoubtedly one of the most peaceful and beautiful places on this planet. It is a heaven for trekkers but a delight to every traveller as it offers serenity and tranquillity amidst picturesque and scenic views of nature. With its plethora of adventure activities of trekking, mountain-climbing, mountain biking, double hump camel ride, jeep safari, paragliding, river rafting; the place is favourite amongst adventure junkies too. Ladakh celebrates colourful festivals, the most prominent are Dosmoche, karsha, spituk and Hemis Festival comprising of drama, dance, singing and drums. The magnificent scenery, dry and clean air and the warm hospitality of the people makes Ladakh truly remarkable. Ladakh is pure magic. There’s no other way to describe its beauty and lure. It is a paradise on Earth. It is a must visit for all travel lovers.